The Pemigewasset River begins it’s journey at Profile Lake in New Hampshire’s Franconia Notch State Park, right below the once-famed Old Man of the Mountain. Popular tourist spots such as Flume Gorge bring many thousands of visitors every year to gaze at its sparkling waterfalls. The Pemi River gets wider and deeper as it travels south until it merges with the Winnipesaukee River in the town of Franklin NH. Thereafter it is the Merrimack River until it finally empties into the Atlantic Ocean at Newburyport, Massachussetts. Except for a 10 mile section between Lincoln and Woodstock, the entire Pemigewasset River is part of the New Hampshire Rivers Management and Protection Program. Historically, the Pemigewasset River was of major importance to the communities through which it passes. Before any roads were built, the river was the primary means of transportation, so that villages and towns naturally grew along its banks, especially at the confluence with other rivers. The Pemi river was also heavily used for fishing and provided hydro power for mills along its banks. When roads (and later railroads) were eventually built in this area of New Hampshire, the rugged terrain made the Pemi River valley the easiest route, contributing to the growth of towns located along the river. Boating, canoeing and kayaking are popular activities on the Pemigewasset River, offering both whitewater and calm water experiences. In particular, Ayers Island Reservoir offers an eight-mile stretch of rapids and Franklin Falls Dam has many miles of flat water for boating and fishing. State law requires that there be a personal flotation device (PFD) for everyone aboard a water craft. All boat drivers with a 25+ horse powered engine must have a New Hampshire Boating Education Card. Of the fish species the Pemigewasset River supports, Atlantic salmon, bass, and trout are among the most popular ones desired by fishermen. Southern parts of the Pemi River are used by New Hampshire’s numerous bass clubs for their annual fishing tournaments, while northern parts of the river provide excellent fishing for trout. Atlantic salmon are being stocked in the Pemigewasset River through a joint effort of the US Fish and Wildlife Service and the states of New Hampshire and Massachusetts. Fish passages exist at Eastman and Ayers Islands and at the Franklin Flood Control Dam. Biking is popular along the many Pemi River trails. 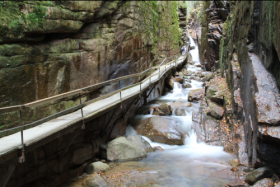 In Franconia Notch there is the Lincoln Woods Trail and the Pemi Trail, a mostly level path that parallels 6 miles along the Pemigewasset River. In Franklin, the easy to reach Franklin Falls trail system was developed by the New England Mountain Bike Association with very few rocks and known for its flowing, buff single track. The Pemi River valley has a variety of native New England Wildlife, giving hikers, nature lovers and bird watchers plenty to view while exploring these trails. Up north near Lincoln NH, there is a number of trails known unofficially as ‘The Pemi Loop‘ for serious hikers. The entire Pemi Loop hike was named the second hardest day hike in America by Backpacker Magazine. Further south in Franklin NH, the hiking is much easier over the 3900 acres at Franklin Falls Dam, and also much easier to drive to. There are many areas in the Franklin Falls 3,900 acres of wooded river valley designated for hunting. Some popular hunting spots are accessed on the Old Hill Village Trail, near the Profile Falls Recreation Area. The New Hampshire Fish and Game Department stocks game birds, maintains wildlife habitats and runs a fur-bearer trapping program. Hunting for deer, pheasant, and small game is permitted only during the state hunting season. Hunting licenses and season dates are available on the NH Fish and Game Website. The entire Pemi River corridor is ideal for natural wildlife as it is mostly undeveloped. A 1987 US Forest Service report listed 19 amphibian and reptile species living in the Pemigewasset corridor, such as the red spotted newt, snapping turtle and northern water snake. Endangered birds that depend upon the Pemi river valley are the golden eagle, upland sandpiper, peregrine falcon and the sedge wren. More threatened wildlife include the bald eagle, osprey, northern harrier, common loon, common nighthawk, Cooper’s hawk and purple martin. The NH Fish and Game department manages the Pemigewasset River Wildlife Management Area. Covering about 45,000 acres, the Pemigewasset Wilderness is part of the White Mountain National Forest. It was designated federally protected land by the Wilderness Act of 1964. Hiking in the Pemigewasset Wilderness is thought by many to be rather challenging as the total elevation change is over 3,900 feet. Most of the wilderness is above treeline so the surrounding views can be amazing. However this area is completely exposed and the New Hampshire weather is very fickle, so hikers must be very careful to plan accordingly. Pemigewasset River article by Pemi Shore Cottages.